Private coaching is particularly useful for players who wish to improve their game rapidly, or for those who are already at a strong level and need help with particular topics such as openings, middle and endgame strategies or just help analysing games. A private coach can assist in choosing and developing an opening repertoire, depending on the student’s style of play, explaining typical tactical and strategical themes involved, and also possible plans for the middlegame for both colours. Private coaching is also an ideal setting for the student to ask questions, in which the coach can cater for their individual needs. Students are encouraged to write down their moves in competition games, so that the coach can analyse their games in detail. This is extremely helpful for improving a student’s standard of play, as the coach can identify and explain strengths and weaknesses in the student’s play, so that both coach and student are aware of which areas need further development to become a more complete chess player. Homework is given after each lesson to compliment the lessons. The cost of coaching varies, depending on the level of the coach who is needed and where the lessons take place. The most economical venue for chess coaching is at the Sydney Chess Centre (Level 1 30a George Street, Burwood NSW 2134). Not only is this the cheapest way of being taught, but we have a lot of coaching and learning resources on hand, various chess books and computer programs available for purchase. There are also many inspiring photos of current and previous chess champions on our walls! Coaching at your home can be arranged, however the price is higher due to travelling time and cost for the coach. The hours of coaching at the office are much more flexible, however home coaching is based on availability of coaches. Internet coaching is also an option, where a coach and student arrange to meet online at a particular time and chess server. This would require downloading a graphical chess interface to assist with coaching. 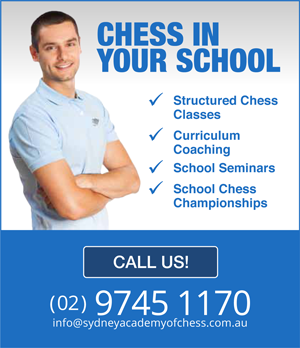 For more information, please call our office - Sydney Academy of Chess on (02) 9745 1170.